It's another international fixture break, which means it's another opportunity for Jürgen Klinsmann to get his message out to the media, which means it's yet another chance for him to criticise America's domestic leagues. This time, his beef is with the lack of promotion and relegation. Klinsmann: "I&apos;m a deep believer in promotion-relegation"
"I'm a deep believer in promotion-relegation systems," said Klinsmann a day before the Americans face Ecuador in a friendly at Rentschler Field. "It's not up to me saying there should be MLS, and there should be second division (that) is NASL, and there should be promotion-relegation. "It's not up to me now saying that MLS is higher level than NASL because I'm not every weekend around either of those stadiums," said Klinsmann. "What we're doing more is we look at the players individually, so we're looking at their path, how they come from their system and where they end up and how they impress then in their respective clubs." If this isn't a direct shot at MLS, it's only because the comments are more accurately aimed at U.S. Soccer itself. U.S. Soccer has actually determined the hierarchy of the American men's soccer leagues, which has MLS as Division I, the NASL as Division II, and the USL Pro as Division III. Klinsmann's saying that without direct competition between every level of American soccer, there's no way to determine who's actually better. "I just wish that we would have a system in place where all the young players and all the players in general know that there's the next higher level and there's a lower level (and think), 'If I play a bad season, then that lower level is waiting for me. If I play a very, very good season then there's the chance to go up and play at whatever you describe then as the highest level.'" "Maybe there are a couple of other guys that just didn't go through that (traditional) pathway. 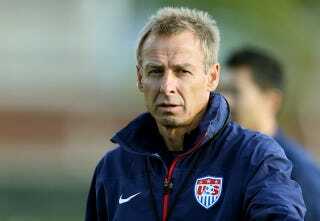 They didn't go this pathway," said Klinsmann. "Our job is to identify the talent, figure out how good he really is. "We've got to weed a little bit where could he go (on) his path, what consequences does it have then he's now with us for him personally, but also sending out that signal to all the other players out there saying, 'You know what, we understand there are so many different directions because the soccer landscape is what it is. It's so different to the rest of the world.'" The usual objection to this and other structural criticisms of American professional soccer is that things are just different here—that reasonably high-level professional soccer is too new and fragile to allow any elements of risk or market competition into it. As Klinsmann's home nation's experience with league rearrangement shows, though, a less than ideal structure can carry a real opportunity cost. For much of Germany's history, there was very little structure to the league pyramid. There were a handful of regional leagues each with their own top league and ones below it, but there was no national league where Germany's best could prove their worth every week against the best of their countrymen. This lack of organization hurt the country's play. Germany were banned from most of the big international competitions during the first half of the 20th Century because of those two World Wars they were so instrumental in. Without the promise of international glory and even without a national professional league, they were still able to churn out some great players. In 1954, they won the World Cup. Soon after that victory, it became very evident to German fans that their soccer strategy wasn't good enough. Those handful of great players were lured to foreign clubs, where there was better competition and more money. Below the few highly-coveted guys, the country wasn't generating enough talent to compete internationally in the way they wanted. Failures to get anywhere in subsequent World Cups and European Championships had fans clamoring for a professional, nationwide top division. An embarrassing loss to Yugoslavia in the 1962 World Cup quarter finals was the last straw. The next year, Germany created the Bundesliga. We know how that's worked out for German soccer. Klinsmann is always talking about how he wants America to not just be respectable, but to reach the heights of the other world powers. Drastic, fundamental changes to the club game, emulating the paths of those currently at the top of the sport, will have to be part of that journey, and that's ultimately what Klinsmann is saying. It's not about Europhilia; it's about the nature of the present system, which is designed principally to ensure no one can fail, and so ensures that no one can be truly great.